Our experienced instructors use proven teaching techniques and various hands-on methods combined with real world application exercises to deliver focused information to users. 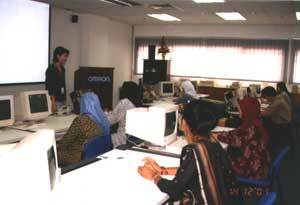 We also offer on-site training to meet the needs of customers who use Omron’s products and systems. Omron offers technical advisory, consultancy services, and training courses for machine makers, system integrators as well as lecturers in the fi eld of factory automation. In addition,we also offer a range of courses tailormade to meet our customers’ needs. Our training courses are typically conducted in our in-house training centre or at customer’s premises upon request. Our training centre is equipped with state-of-the-art technologies with fully air-conditioned plus carpeted classrooms, multimedia projector, network-linked computers, wide range of demonstration kits such as different models of PLC, Servo Motor, Sensor Training Kit, Touch Screen, etc. We also have a cosy meeting area with complimentary beverages and refreshments for our clients to relax and have their tea breaks. Our clients include Matsushita, Epson Toyocom, NEC Semiconductor, Shin-Etsu, Politeknik, Institute Latihan Perindustrian, Sekolah Menengah Insitute, and many others.